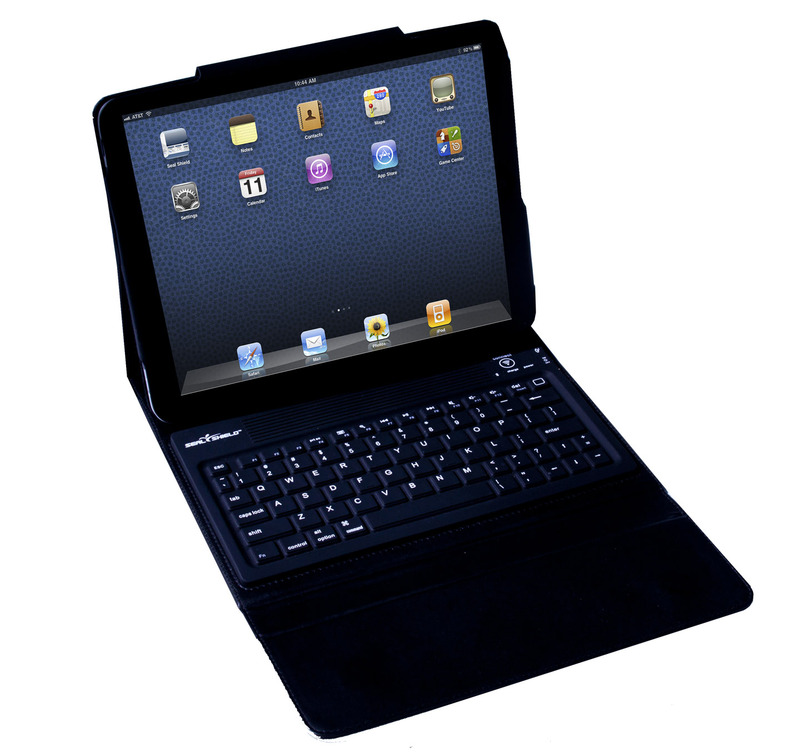 Article first published as iPad Accessory Review: SealShield SilverBlue Wireless Keyboard with Luxury Case on Blogcritics. With the new iPad now in the hands of millions of happy customers, it's a great time to consider how you are going to protect your $500+ investment. The iPad accessory market is booming, and there are thousands of products to choose from with a wide range of prices to match. In terms of shielding your iPad, there are iPad cases, there are iPad cases with a keyboard, and then there is the SealShield SilverBlue Wireless Keyboard with Luxury Case. I had the chance to tote my iPad 2 around in SealShield's newest case for the past weeks, and the product has been growing on me more and more. Find out why below. Upon first glance and subsequent touch, it becomes clear that the quality of the case is solid. The "top grade" material (however, I found no mention whether the material was leather or not) feels very soft and smooth to the touch. To hold the iPad in place, there is a Velcro flap at the bottom that makes it extra snug and keeps the device secure. At the top though, there is an easily movable flap that allows for easy in/out of the iPad. I found this design particularly useful as there are many times when I don't need a hard keyboard and I'd instead rather take advantage of the iPad's portability and use the tablet sans case. The magnetic on/off functionality of the iPad is retained with the case, and again, the look/feel of the case from the exterior reminds you of a very elegant black portfolio. Having the flap on the left side took some getting used to for this reviewer, but did not take away from the functionality of the device. I would have welcomed a pen or stylus holder. Once you perform an increasingly typical setup process involving the bluetooth connection, the SealShield SilverBlue Wireless Keyboard connects easily and quickly to the iPad in future processes. There is a dedicated on/off switch on the keyboard which allows you to save battery life when you know you're not going to be typing away (tip: turn off the Bluetooth on the iPad as well to save power there). Next to the on/off switch is a mini-USB port to connect the included charging cable. Battery life for the keyboard is stated to be 100-day of standby usage, and I have yet to charge the device after about a week of testing. The feel of the keyboard leaves a little to be desired. The keys are soft and a bit small, but I have grown accustomed to these specs, and I have had little trouble getting my emails sent, and still in much less time than with the onscreen keyboard. Another nice feature that is found on the SealShield SilverBlue Wireless Keyboard and rarely on other keyboard cases is the inclusion of backlit keys. Similar to a Macbook Air, you no longer have to hunt and peck in the dark as each of the 76 keys shines when the LED feature is enabled. And did I mention that it's spillproof? There's a reason why the keys on the SealShield SilverBlue Wireless Keyboard are a bit mushy and small. The entire keyboard is spillproof. SealShield is known for their infection control products, namely keyboards, mice, and remote controls that are protected from antimicrobials. In environments where multiple people are touching the same devices (schools, hospitals, and libraries), having a layer of protection is invaluable, and I've had successful experiences using their keyboards at our high school. In the case of the iPad Wireless Keyboard case, the small sacrifices in performance one makes on the tactile feel of the keyboard are made up for in the piece of mind that 1) you could spill something on the keyboard and not ruin it, and 2) that keyboard won't have as many living creatures growing on it over the course of time. Overall, SealShield has produced a high quality option in the keyboard case market, and one that is reasonably priced yet offers numerous features that distinguish it from the rest. The SealShield SilverBlue Wireless Keyboard with Luxury Case is available direct from SealShield for $89.99.